Did you all have a nice weekend?? I sure did. It was a beautiful sunny warm weekend here in Vegas. We started out at a lacrosse game that we tied 4-4 which was VERY EXCITING because we are a brand new team and have been losing badly all season. So to hold our own and almost win was beyond thrilling!! We only have a couple more games left this season. The boys really made progress. Mine is the little guy in the orange socks. I did a little scrapping this weekend but mostly DT projects which I will share in the next couple of days. Well, today is the last day of April (where did that go??!!) and you have until midnight PST tonight to upload your April Mother's Day projects on the Crafter's Companion USA Challenge Blog. Come on girls show us your projects!! And I have exciting news for May. Crafter's Companion is feeling very very generous and there will be giveaways everywhere!!! We will be giving away a weekly prize on both the Crafter's Companion Informational blog AND the Crafter's Companion USA Challenge blog! ALSO, each of the Design Team members will be giving away a weekly prize!!! You can find their names and links to their blogs on the sidebar of the Crafter's Companion Informational Blog. And EVERY DAY IN MAY we will be giving away a Crafter's Companion Ultimate Tool to a randomly chosen person who purchases something in our online store!!!!!!!! EVERY DAY!! Are you as excited as I am??! I will post my first Crafter's Companion giveaway here tomorrow on May 1st. So you will definitely want to stop back by and join in and try to win! 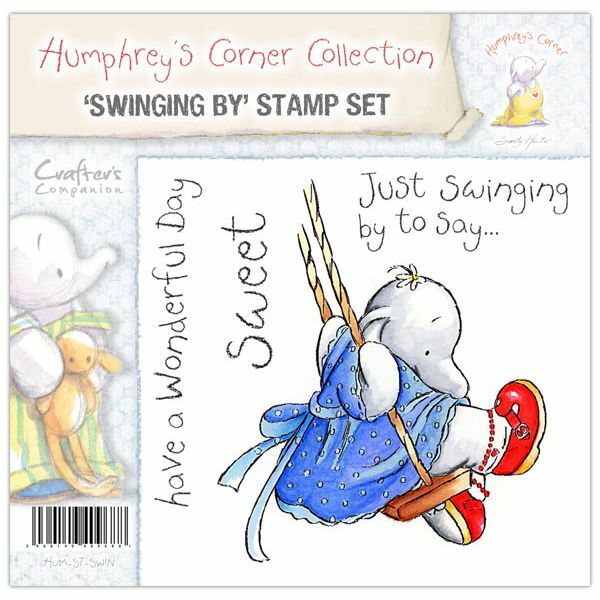 We are also still giving away a new Humphrey - Swinging By stamp set on the Crafter's Companion USA Challenge blog this week. You just need to go HERE and leave a comment. I can't seem to help myself from taking photos of blooming flowers even though I know I never do anything with them. Well, this time I decided to dedicate a layout to flowers blooming in spring. I started with some gorgeous patterned paper from My Mind's Eye - Miss Caroline collection. YUMMY!! It just screams spring doesn't it?! The sketch is one of the sketches we are working with in the 28 Days of Sketches class I'm taking online at BigPictureClasses. I love starting with a sketch because it just seems to get my creativity off and running. How about you?? Do you use sketches for inspiration? I hope you enjoy my layout. Thanks so much for stopping by and looking! Here is an Easter layout I made this weekend. I have been looking at all the awesome "guy" cards and projects that the design team from Crafter's Companion has been sharing using the new Stamp It Australia-Guys in our Life stamp collection. Aren't you always kind of on the look out for masculine stamps?? I know I am. 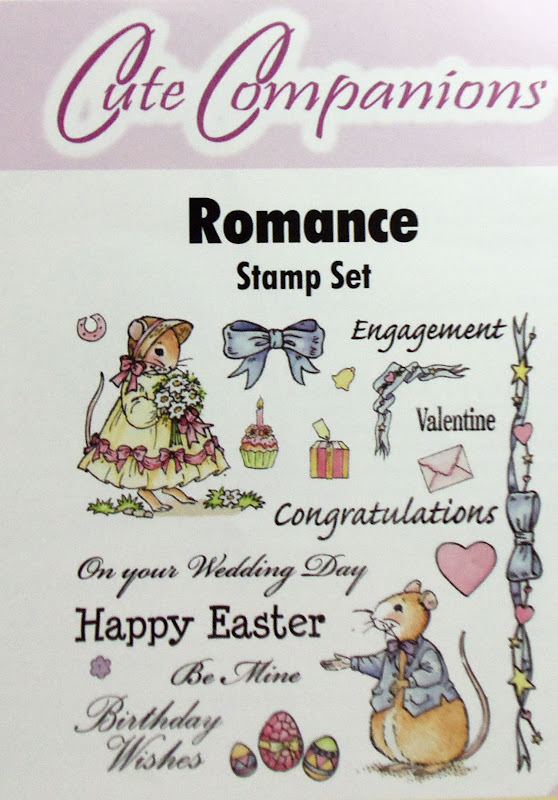 However, I wanted to show that these stamps don't have to be only for the guys in our life. I decided to take the Overlapped Text Stamp and stamp it onto some of my purple Pearlescent Pastels paper and use it as matting for an Easter photo of my kids. I really love the texture this stamp brings to the matting around the photo. And it is just so soft and pretty with all these pastel colors. I pulled some ribbon and bling from my Tiggy-winkle papercraft bundle of goodies I bought from the Crafter's Companion store. I typed up my journaling in Word and printed it out on some cream Pearlescent paper and then cut it into strips. I really like how it all turned out. Winner, Winner, Scavenger Hunt Dinner! The winner of my personal blog hop prize from the Crafter's Companion Scavenger Hunt Blog Hop is Rhonda Miller!! Wow, what a gorgeous card. TFS. Rhonda congratulations!!! Please email me your full name and address to scrapwithstacy(at)gmail(dot)com. You have until Monday, April 30th to do this. If you do not send this information by that date you will forfeit your prize. Thanks to everyone who hopped along!!! It was so much fun going around and visiting your blogs too!! 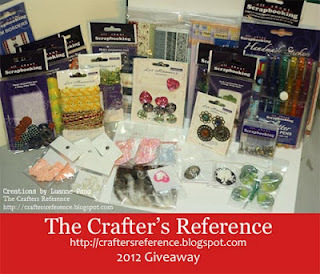 Please check out the Crafter's Companion Informational blog tomorrow to see who was chosen as the Grand Prize winner!! Crafter's Companion Scavenger Hunt Blog Hop! I'm so happy you hopped by today!! Before we get started I wanted to share the project I made for you today. I really love the Stamp It Australia line of stamps. I pulled out the Bird Cage (by Yi Hua Law) Stamp and stamped it out twice on some cream colored Pearlescent paper. I fussy cut one of the images out and then layered it over the other stamped image for some added dimension. I love this paper from Graphic 45. It is just really rich looking and goes perfectly with the pearlescent paper I chose to use. I typed up my sentiment in Word and printed it out on the pearlescent paper and then die but it out. I added a little bird and some ribbon from my stash and it was all done! I hope you like it. Now let's get you started on the Scavenger Hunt! There are 12 design team members and each of us has a question that will give you clues to 12 different items that you can find in the Crafter's Companion Store. So your goal is to hop around to all 12 blogs and get all 12 questions and then hop over to the Crafter's Companion Store to find the answers. After you have found the answers you will then put them in an email to Bindy at bindy@crafterscompanion.com. Please put CC Blog Hop in the subject line of your email. 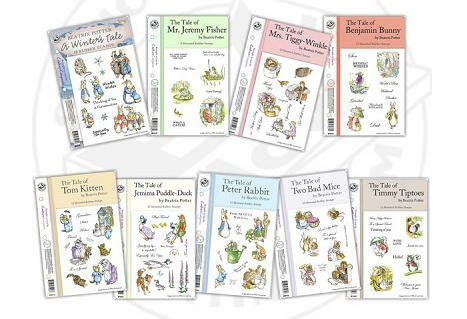 If you do that and follow the other requirements which I will tell you in a minute you will be entered into the drawing to win the Grand Prize which is the entire Peter the Rabbit Collection of Stamp Sets!! This will add up to 9 (!) awesome stamp sets! Along the way each designer will have a project to inspire you and also the possibility to win on their individual blogs too!! 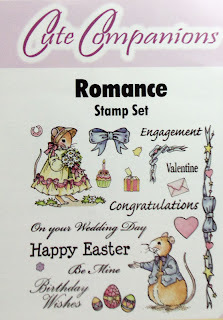 Each designer is giving away a Cute Companions -Romance stamp set, two embossing powders (one white and one blush rose) and one sheet of EZ mount foam! 1. You will need to be a follower of me AND Crafter's Companion Informational Blog. 2. And you must leave me a comment letting me know you stopped by to hop along. 1. You must leave a comment on Each Design Team members blog and on the Crafter's Companion Informational blog. What is clear, square and 3"x 3"? 13. 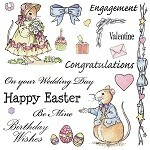 Finish up on the Crafter's Companion Blog - http://crafterscompanion.blogspot.com/ And let us know you hopped around to all 12 blogs. Thanks for hopping along. Now you need to hop on over to see Dawn L. Good luck! Stacy here with my April Spring Fling project for Scrap Our Stash that I want to share with you. As you probably know we recently got back from our Spring Break vacation to the beach in southern California. The weather was good for most of our trip but there were a couple of cool and windy days. It didn't stop us from having fun though. I took this photo of my daughter while she was building a sand castle on the beach. This was one of those not so great days and it was super windy. When she looked up at me her hair was just flying. It cracked me up so I quickly took a photo. I used pattern paper from Doodlebug Designs in a spring value pack of goodies that I had in my stash. I used some embellies from the Echo Park Splash kit also from my stash. I actually worked on this while we were on Spring Break so I was limited in what I had to work with on the layout. I have been taking the 28 Sketches class at Big Pictures Classes and I took my inspiration from one of the many sketches we are working with this month. Do you guys take any online classes?? I have recently been taking quite a few classes. My favorite one has been the Creative Chemistry class over at OnlineCardClasses. Best class EVER!! I recommend it to any and everyone. You can still go take it now, you just won't have Tim online everyday answering your questions. But I think we asked enough questions that if you have any issues you can find easily find the answer. 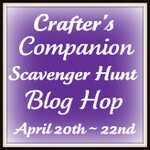 I want to let you all know that TOMORROW Crafter's Companion is having a Scavenger Hunt Blog Hop!! It ends on Sunday, April 22nd at midnight PST. It is going to be fun and there are going to be some really awesome prizes that you won't want to miss out on possibly winning. So stop back over here tomorrow and join in the HOP! The HOP starts here! 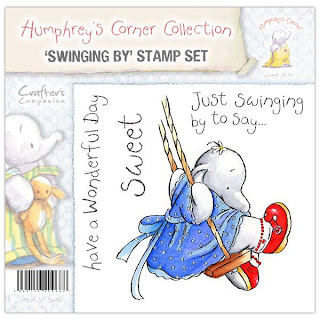 ALSO, today is the last day to enter to try to win the SWALK stamp set being given away on the Crafter's Companion USA Challenge Blog (US residents only). Go over there and leave a comment after you are finished here. Okay, off you go. Have a wonderful Thursday!! Hi guys!! I want to show you a card I made with the Peter Rabbit paper craft collection bundle I recently bought. This bundle contains quite a few awesome goodies. There was much fun stuff to play with I could hardly wait!! LOL I decided to work with two of the 3D toppers for the front of my card and a rub on and stamped sentiment for the inside of the card. I made a Center Step Out Card and I want to show you how I made it. I started with a piece of paper 6" x 12". If you want you can make a template that looks like this one. (click on the image to enlarge) You can follow the measurements on mine. 2. Measure down from the top 1 inch and measure over from that 1 inch. Make a dashed horizontal line on both sides. 3. Draw 2 solid lines down from the inside edge of each of these dashed lines. Go down to the dashed line you drew at 7 inches down from the top. 4. Under the top 1 inch dashed line measure down 1 1/2 inches and make another horizontal dashed line on both sides. 5. Finally you need to measure down from the top dashed lines 4 3/4 inches and make a dashed horizontal line between the two solid lines. Now all you need to do is cut on the solid lines and score and fold on the dashed lines. Your base card should look something like this. And here is a front view. My directions probably make it sound way more complicated to make than it is. Just look at the template. You could just lightly pencil in the lines on your 6" x 12" paper and then erase them after you get it folded and cut. (that is what I did) Now that you have the base made you just need to decorate it. I pulled out some patterned paper(Echo Park-Splash) and decorated my base card. I die cut a shape for the outside and another matching one for the inside out of some fun paper. I decided to make the card be fairly clean and simple. I added the main topper to my die cut shape on the front. I put the smaller sentiment topper under the main topper. I used some of the bling from the fun bundle to add a bit of sparkle. Then I got out some ribbon from my stash to make a pretty bow for the front. I stamped out my sentiment and used a rub on on the inside. 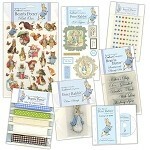 I just love all of these sweet Peter Rabbit goodies. And just think you could love some of your very own if you go join in on the April Mother's Day challenge on our Crafter's Companion USA Challenge Blog. The main prize is your choice of this bundle of goodies or the Tiggy Winkle Collection! What are you waiting for!!? LOL Seriously...are you waiting for?! AND if you love Peter Rabbit as much as I do you will definitely want to join in on the Crafter's Companion Scavenger Hunt Blog Hop that starts this Friday, April 20th and ends on Sunday, April 22nd at midnight PST. 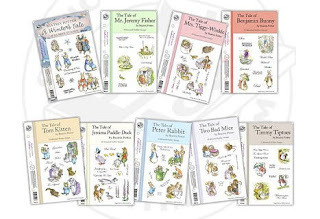 The grand prize is the COMPETE collection of Peter Rabbit stamp sets which is a grand total of 9 stamps sets!! And each Design Team member is giving away a prize on their personal blogs too. It is going to be a blast and you are not going to want to miss it. So mark it on your calendar right now. The hop starts right here on my blog on Friday. I want to leave you with a little photo of my daughter at her Cheer Competition last Saturday. They didn't win but they had a blast and did a great job. Thanks for stopping by today and looking at my project. I do have some fun happy mail to share. I got this a little while ago but forgot to post it!! If you know me at all, you know I am addicted to "mystery box" sales. (anyone know of a doctor that I can see about this problem?!?! lol) Well as soon as I saw that Maya Road was having a mystery box sale I had to hop on over and buy a box. **SMILE** I was already happy as soon as I saw that ginormous bag of ribbon!! LOVE IT!! Next I took of the bag of ribbon to see what other riches awaited me in this yummy box of goodness... Still smiling!!! 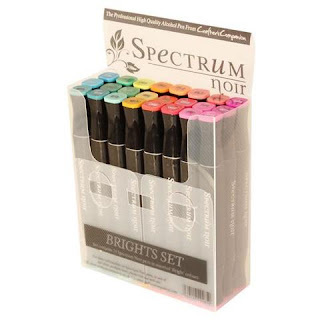 Spectrum Noir Markers GIVEAWAY!!! Hurry! The theme is Easter or Spring. Use the sketch and you can create a Card or Layout! I think it turned out super cute. I used spring colors to inspire me and a Anthony and Burt-Hope You Feel Better Soon Stamp from Crafter's Companion. I added the velvet ribbon with my We R Memory Keepers Sew Ribbon Weave Punch. I am still having so much fun with those things!! LOL I had to adjust the punch holes to fit in the space on the bottom. I'm not sure if you can tell that they are actually a little shorter than the ones on the top? That fun yummy flower is from Petaloo. I also wanted to show you this card I made for the April Mother's Day Challenge at Crafter's Companion USA Challenge blog. I cut out the shapes using a Spellbinders Nestabilities die set. I tied those two strands of ribbon into a bow on my Ultimate Tool. And I colored this little guy with my Spectrum Noir markers. The Crafter's Companion Store just got in MORE new colors and they are going fast. 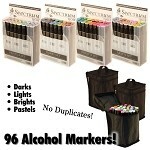 If you are interested in these awesome markers you better hurry!! The new colors are in sets of 24. Go check them out. 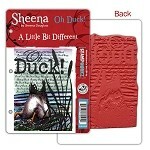 And also remember today is the last day to try to win the Sheena A Little Bit Different-Oh Duck stamp set over on the Crafter's Companion USA Blog (US residents only). You have to actually go over there and leave a comment. Go HERE. The Crafter's Reference has a nice blog candy giveaway. You should go check it out!! Hello everyone! 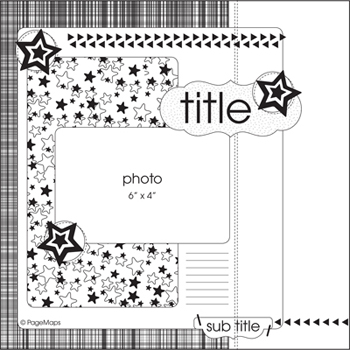 I have another layout that I have made using those gorgeous Art Kure - Britain in Bloom stamps. Are you tired of me yet?! lol I just can't seem to get enough of them! This time I went with the Daffodil stamp set. I stamped out the image on Ultra Smooth Premium White Card stock for Alcohol Markers. This is really just the best paper for the Spectrum Noir markers! I colored my image with my Spectrum Noir markers. LOVE THEM!! Then I fussy cut the colored image leaving a small white border around the flower. I've been having fun playing with the new We R Memory Keepers Lucky 8 punches I bought. I actually started by using one of my punches and punching a decorative circle on a 12x12 piece of card stock. I cut out a circle from a piece of floral paper from Sassafras - Sweetly Smitten collection. This collection is just so soft and pretty it immediately reminds me of springtime. It really felt like it needed something more so I got out my paper piercing tool and my mouse pad then I just started evenly punching holes around the edge of the circle. When I finished punching the holes I got out my needle and embroidery floss. I like using embroidery floss because you can take away strands of the floss depending on how thick you want your sewing line to be. I decided to do a back stitch. To do a back stitch start from the underneath side of your paper and go up into the first hole. I just taped down the floss on the back of the paper taking care not to cover any of the punched holes. Next insert the needle down into hole number 2.
and the back down into hold number 2. Then just continue doing this all the way around your paper. It should look like this. Well, how did your weekend turn out?? If you celebrate Easter, did you have a good Easter?? We certainly did. The kids were thrilled with their baskets from the Easter Bunny, they had fun coloring 10 dozen eggs and then hunting them in our backyard. Next they actually swam in our pool (!) for about 2 hours! I guess it wasn't as cold as I thought it would be. Then we finished up the day with a nice Easter dinner of ham and all the fixings. YUM! The kids all went back to school yesterday after our nice Spring Break vacation. Then my poor daughter (the older one) came home from school feeling terrible so I called the doctor. We rushed over and than sat and waited about 2 hours (!). She has an infection in her throat and we got her on some antibiotics. Poor baby. My hubby had to go out of town for work today and my mother who has been visiting is leaving us tomorrow. Then it will just be me with the kiddies. I wanted to show you a gift box I made using the new Sheena Douglas -Just 4 You stamp set. The Ultimate Tool comes with a informational booklet and a DVD that takes you thought using your Ultimate Tool step by step. The instructions are easy to follow and fun to do. After making my box and lid. I stamped out the image in blue. Next to make the one Ewe stand out I stamped out my image again but this time I stamped it in green to match my papers. I fussy cut the head of the specific Ewe I wanted to focus on and then used double sided adhesive foam to lift the green Ewe head and add some dimension. So super quick and easy!! I plan to fill the box with some goodies for my friend's birthday which is coming up soon. I think she will get a laugh from the fun image. Okay enough for now. Have a great Tuesday!! I'm back...did you even know I was gone?! Happy Easter (if you celebrate it)!! Has anyone even noticed I have been gone?~! This week was Spring Break for my children and we took them to southern California for a little trip. We rented a house not too far off the beach and close to our friends who live in the area. We had a great trip!! I will tell you more about it in a later post. I just wanted to say hello and Happy Easter. The Easter bunny came last night and my kids were pretty excited this morning when they ran to the door to see what was left. I'm not sure why they decided to look through their baskets while sitting on the stairs but they did. I couldn't talk them into coming down. They were too engrossed in their baskets to look up and smile at me but I did get them to smile after they finished.